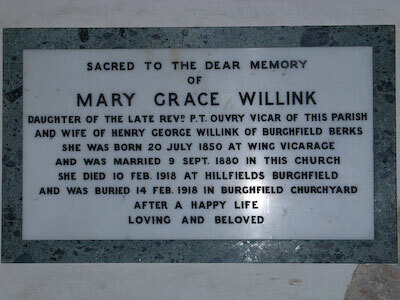 Sacred to the dear memory of Mary Grace WILLINK, daughter of the late Revd P.T. Ouvry vicar of this parish and wife of Henry George Willink of Burghfield Berks. She was born 20 July 1850 at Wing Vicarage and was married 9 Sept 1880 in this church. She died 10 Feb 1918 at Hillfields Burghfield and was buried 14 Feb 1918 in Burghfield churchyard, after a happy life, loving and beloved.